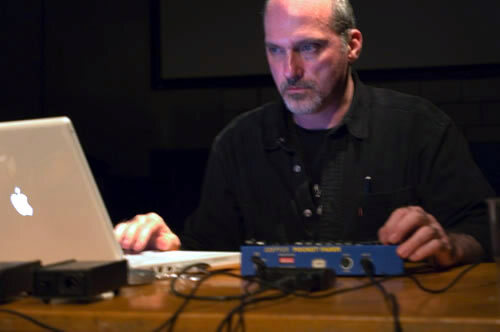 Kim Cascone has a long history involving electronic music: he received his formal training in electronic music at the Berklee College of Music in the early 1970s, and in 1976 continued his studies with Dana McCurdy at the New School in New York City. In the 1980s, after moving to San Francisco and gaining experience as an audio technician, Cascone worked with David Lynch as Assistant Music Editor on both Twin Peaks and Wild at Heart. Cascone left the film industry in 1991 to concentrate on Silent Records, a label that he founded in 1986, transforming it into the US’s premier electronic music label. At the height of Silent’s success, he sold the company in early 1996 to pursue a career as a sound designer and went to work for Thomas Dolby’s company Headspace as a sound designer and composer. After a two year stint at Headspace he began working for Staccato Systems as the Director of Content where he oversaw the design of new sounds for games using algorithmic synthesis. Since 1980, Kim has released more than 15 albums of electronic music and has worked/performed with Keith Rowe, Peter Rehberg, Oval, Scanner, Carsten Nicolai, Doug Aitken, and David Toop among others. Cascone has performed at the Lovebytes Festival (UK), Micro 2 Mutek (Montreal), Transmissions Festival (North Carolina), Observatori (Spain), Tate Modern (London) and recently performed “Anti-Correlation” throughout Europe. Recent lectures on Post-Digital Music at Tate Modern (London)*, Mediamatic (Amsterdam) Museum of Contemporary Art (Denver), Refrains Conference (Vancouver), Observatori (Spain), Stanford University/CCRMA (Stanford), Re-Lax (Ljubljana, Slovenia) and Kunstlerhaus Stuttgart. Cascone was one of of the co-founders of the microsound list (http://www.microsound.org) and has written for Computer Music Journal (MIT Press), Artbyte Magazine and Parachute Journal.